You look rather ready for November to me, with your acorn, pumpkin and falling leaves, but I'll see what I can do to make you ready for Thanksgiving day. Give me a day or so and check back. Now check yourself out ready for Thanksgiving! I have an idea which one you will choose. I can't wait to see which one it is. OH THANK YOU!!!!!!!! BRANDI>>>AWESOME!!!!! I LOVE em all!! I, of course, pick the one with the golden bow!! I have saved them all though..so I can change her clothes without bugging you again!!! Thanks for your dedication and time in making Her Bee-U-Ti-Ful!!!!! I LOVE HER!!!!! But you know, I had to try turning her into a pilgrim (that was a disaster, LOL) and a native American for Thanksgiving, just to see if you might want them. I am glad you like her. She fits on that window sill perfectly! Makes me smile that you are pleased! OOPS AGAIN!! How do I keep getting IN your box???? I am sorry!! Will try harder to get it right!! But you asked for an avatar with your four boys (as monkeys) with one being an angel. I think I understood that correctly. I looked and looked for a group of monkeys to use for this and only came up with this group I used below. If you can find another group that would suit you better, please do and give it to me to work with. This is the best I could come up with using the grouping of monkeys I found. I gave the boys on the right each a different santa hat, your boy on the left, a sparkling halo, and you got a big red bow. (You are really bald. LOL) As you can see, getting that many monkeys into an avatar makes them a bit small. Thanksgiving indian would be noice too.. I will copy one to my photobucket and put him up now. Thanks! I had not started making you monkey coffee guys last year at Christmas time. So you won't find any. 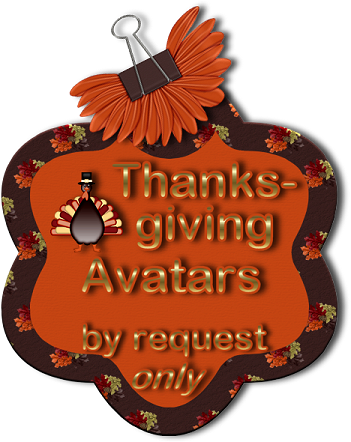 LOL I'll make you some and give them to you when I unveil Christmas avatars on Dec. 1. You're gonna keep me in suspense eh ? Thanks !! Love the pie..
Let's have the Thanksgiving holiday before Christmas, ok? Instructions are at: http://scaredmonkeys.net/index.php?topic=4314.msg996440#msg996440 for using in your signature. Thank you so very much. I hope I plugged them in there right. uhh... errr... ummmm help?? how can I line them up?